On First Take Fridays a number of authors around Meeple Mountain give short first takes on games that are new to us. This week we have takes on KeyForge: Call of the Archons, City of the Big Shoulders, Startups, and SPQF. My only experience with a CCG or LCG was collecting Pokémon cards in elementary school. For me, they were simply the new fad because I watched the TV show and liked the Game Boy game. Since then, I haven’t had the desire to invest my time, money, and energy in this style of game. 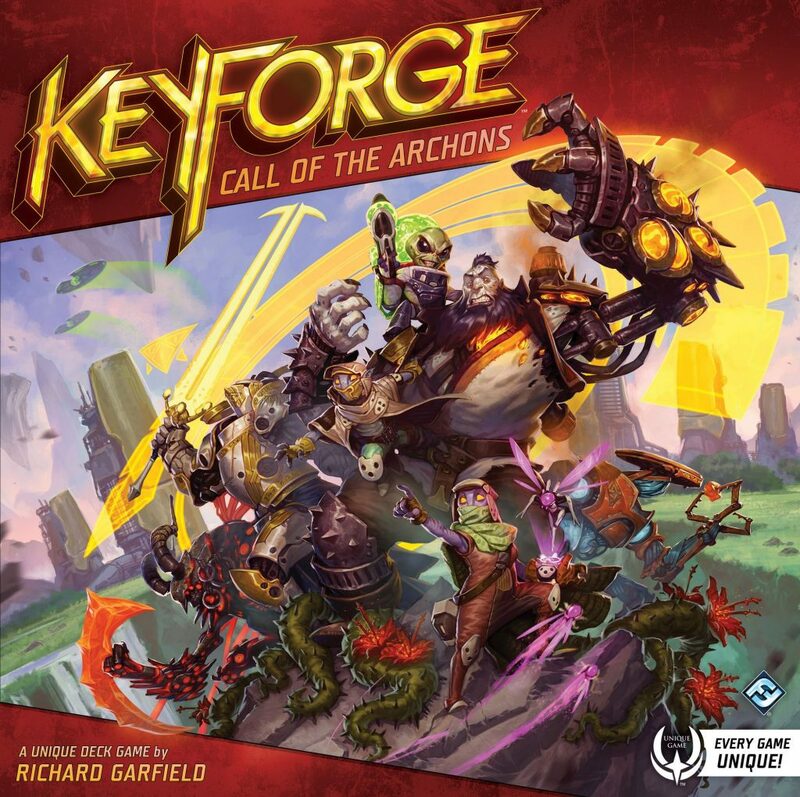 I was, however, intrigued by KeyForge: Call of the Archons, especially since it’s designed by Richard Garfield. KeyForge is a tactical card game in which you reap æmber and use it to forge keys (among other things). It simulates a collectible card game without any of the collecting since the game introduces completely unique, prebuilt decks. Each deck and its card combinations will never be duplicated (apparently there are more than 104 quadrillion possible decks) and it requires no boosters or deck building. All the hard work has been done for you! Since I’m a euro gamer, trying to strategize and maximize the card powers really called to me, but I was initially overwhelmed by my deck. That feeling quickly disappeared since each deck only has 3 Houses (factions) to consider. This restriction helped me build card combos and synergies. I was also impressed by how streamlined the gameplay is: on your turn, you announce a House then play cards from your hand or activate cards in your tableau matching that House. You don’t have to manage mana or any card costs. This made each turn rather quick and helped the game flow smoothly. No turn ever felt wasted either. Sometimes I had a turn that was less action-packed, but that just meant I was setting things up for a power move the next turn. I really wasn’t expecting to enjoy KeyForge as much as I did! I feel like I got the CCG/LCG experience without any of the hassle or commitment. What do you do when it’s raining outside and you’ve got a nice screened-in back porch? You invite some friends over to play a prototype of an upcoming Kickstarter. That’s what! 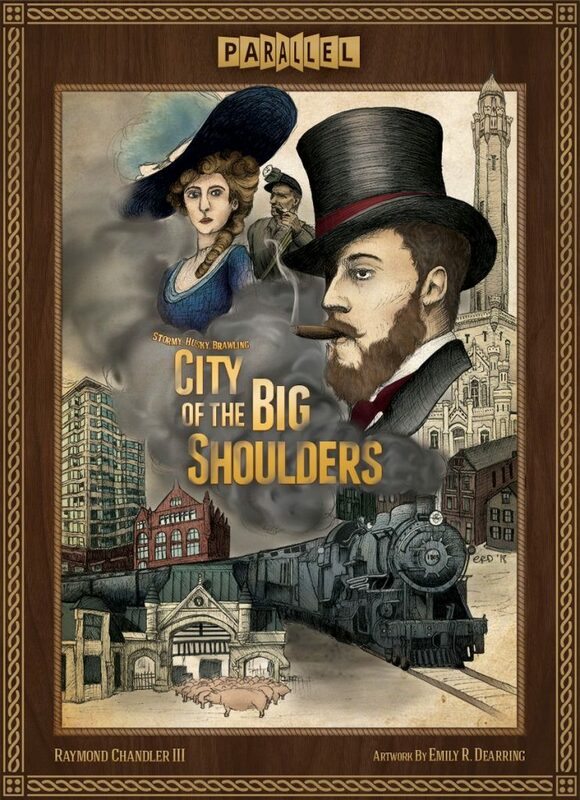 This past weekend, my friend and his husband joined my wife and I for our very first playthrough of City of the Big Shoulders (hitting Kickstarter on November 6th), an 18XX style game that has the players taking on the roles of savvy investors in late 19th century to early 20th century Chicago as the city bounds back from the great Chicago Fire of 1871. The players start new businesses and buy and sell stock in those businesses. As the game moves on, the companies become more streamlined and start producing goods which the companies can sell for money. This causes the company’s stock value to rise. When those companies pay out stock dividends, the shareholders earn income which they can then use to invest in other companies or buy additional shares from existing companies. It’s a game of managing resources effectively, buying low, and selling high in an effort to become the wealthiest businessman by the game’s end. The copy that I was sent is a prototype with prototype rules. As such, we struggled through the first round or two since we were all new to the game, but it didn’t take long for us to catch on to what was going on mechanically. I think that some of the overarching strategy eluded us and that we would all fare much better with additional plays. City of the Big Shoulders is probably the thinkiest game I have ever played – partly because of the sheer amount of stuff going on in the game and partly because of the heady math involved. Be aware of that if you’ve been looking at this game. There’s a lot of number crunching. Minus the few hiccups we encountered along the way (iconography which we didn’t have an explanation for, as an example), I found the game to be very engaging and very enjoyable. This is one that I will be backing for sure. Startups gave me some No Thanks feels. It’s an interesting little game where you must choose whether or not to invest in a specific startup. Each turn players must draw a card and either play or discard a card. The discarded cards are left faceup in a market. If on your turn you choose not to pick up a market card, you must put down one of your ten coins on it in the No Thanks fashion. Whoever ends up picking up that card, will get whatever coins have accumulated on it. Choosing when and when not to play a card is the main strategy. You want to have the most shares in a startup, but you don’t want to be the only one to invest. At the end of the game players reveal their hand, and those shares are combined with the companies that you publicly invested in. If you have the most shares, all other shareholders give you a coin. You want to end the game with the most dollars. There are some fun little mechanics that prevent players from being able to have a monopoly on one company, and if players are clever they can use them to their advantage. All in all, I quite like it. Its quick, it’s fun and it allows for a variable player count (3-7). The game is easy to grasp and allows players to take on a light-hearted “take-that” attitude. The art is also quite fun. It really captures that startup feel. One final bonus is that its in such a tiny box that you can put it in your purse and take it anywhere. Read more from Kathleen Hartin. I can’t say deck builders are my favorite genre, a month ago the only two in my collection were Paperback and Hardback. 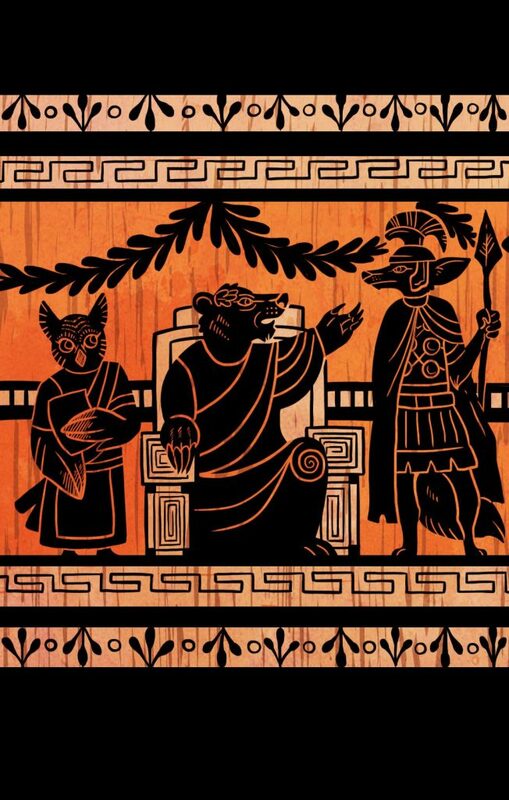 But a few months ago when I saw SPQF on kickstarter I was intrigued – a deck builder, civilization building game with a few interesting mechanisms tied in. SPQF does a few things right, it creates for easy to execute combos and engine building opportunities in your deck while providing plenty of depth in your strategy, there isn’t much down time because of an interesting follow mechanism, and for a game with interesting depth the gameplay doesn’t overstay its welcome. The one part of the game that really stood out as unique was the card purchasing mechanism. At the end of your turn, all of your cards that you didn’t play are made available to other players to acquire on their future turns. That simple change, of forcing you to evaluate how to use your cards – following other players, modifying your actions, or not using them, becomes critical to building your engine and withholding cards from your opponents. SPQF is the first deck builder I’ve played where I felt the multi-use cards were executed in an interesting way. The only real complaint I have was with the rulebook. 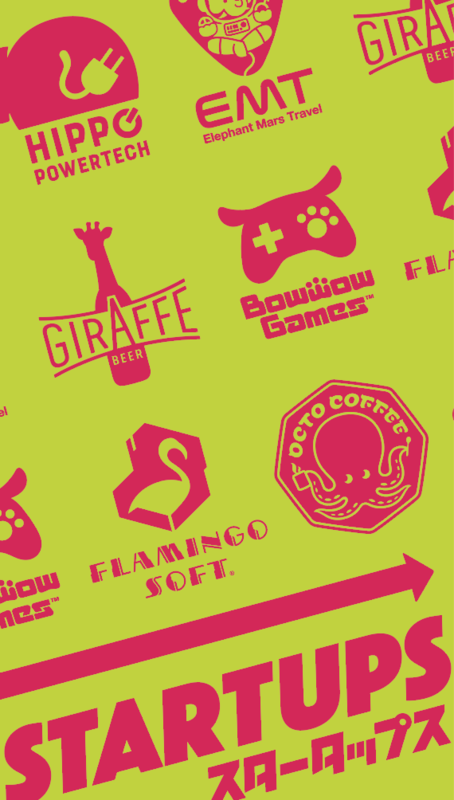 It was pretty challenging to learn the game and understand the iconography. If this game gets in the hands of a larger publisher I’m sure those types of issues will be worked out.